The older my mom gets, the more she reminds me that you can’t take money with you when you die. She’s right, but that didn’t stop her from demanding I give her at least $7,000 for her 2008 Mazda Miata. She’s happy to let me inform you that she got her price, and rolled home in a 2017 Miata with 52 miles on it. The only problem is, it wasn’t me who gave her that much. You might have seen our review comparing the new generation of the Miata, the ND, with the third-generation NC. The ND was a 2017 Miata RF on a press loan to me for the week, while the NC was my mom’s 2008 Miata—both were six-speed manuals that had only slight differences in driving, but the ND was shiny and new. That’s my mom’s weakness: shiny and new. Plus, you can’t take it with you. My mom, Jodi, has always been a car enthusiast in the sense of loving to drive good cars. She doesn’t care about the different names for Miata generations, and she always forgets that the BRZ is the one that’s a Toyota and a Subaru, but that’s because her passion is in driving rather than in knowing all of the obscure car facts the world has to offer. She’s had a Miata for as long as I can remember. When her five-speed 1996 NA, a first-generation Miata, got to the point that she was putting more money into it than it was worth, she parted with it for a used 2008 NC. I can still remember her sending me the photo of the two of them side by side from the dealership, because my mom almost never tells anyone she’s buying a new car until it’s done. People will judge her for her car compulsion, she thinks. When I got that 2017 Miata for a review, I could see it in her eyes. She wanted it, and it wouldn’t be long before she’d go buy one herself. Knowing her secretive tendencies when she buys a new car, I asked her to offer the old NC to me before she made a deal at a dealership. She then became a living Craigslist ad, insisting that she wouldn’t take any less than $7,000 for the car. It was a great deal for a private sale since her Miata had only 65,000 miles on it, but I’m stubborn. I told her I’d give her $5,000 after a daughter discount. I’m a chronic lowballer with most things in life—and usually a successful one, I might add. Just ask the people who sold me a home last year. But she knew what she had. She began randomly calling, texting and visiting me under the guise of wanting to “check in.” That’s when she’d slowly slip some figures into the conversation, like the fact that her expensive new tires only had 6,000 miles on them or how fun the car was to drive on a sunny day. She even went so far as to, when I asked her to go look at artificial Christmas trees with me, pick me up in the Miata. Do you think we were able to fit my 9-foot Christmas tree into a two-door roadster? No. We had to ask the store to hold it so we could go get another car. As time went on, she got a little less insistent, and a little more honest, on the features of her car. There was a leak draining the washer fluid, and she got a rock chip while driving it the other week. I thought it was odd of her to tell me this, since I was a potential buyer. Then the Miata talk went silent. I called her on Saturday, seeing if she wanted to go look at boots for my trek to the northern tundra of Wisconsin next week. She didn’t answer. “Can I call you later?” she texted me, about 15 minutes after I called. That usually means she’ll call in a few minutes, so I didn’t even bother to text back. “Give me a few I’m the middle of something,” she texted more than half an hour later. Surely it wouldn’t be longer than an actual “few” this time around. This was getting weird. It was nearly an hour after that text when she finally called. There was a lot of wind noise, and I knew she was in a car—but not one of hers. She kept repeating that she was “in the middle of something” for longer than she’d planned. I got the feeling she both wanted and didn’t want me to ask what, but after about the fifth “in the middle of something,” I finally did. “I got $7,000 for it,” she said. My mouth fell wide open. She did it. She bought a new Miata, sold her old one, and didn’t even give her stingy-yet-still-blood-related daughter a chance to counter. She even took her customary side-by-side picture. She was driving back from Arlington, where she traded her NC for a brand-new ND because she “couldn’t find any used ones” she liked. She was going to ask me to make the trip with her, she said, but figured I would get mad at her for buying new instead of used. I never got the chance to say goodbye to the NC, or, you know, buy it, but I turned my bitterness into happiness for her: She got her price and she got her car. That’s what’s most important. She also got $7,000 off of MSRP on a black, soft-top Grand Touring trim of the ND—a 2017 model that probably should have been gone a year ago—but the dealership salesperson told her they couldn’t sell it. “Nobody wants a manual,” he told her, as a 2018 automatic version sat in the showroom. 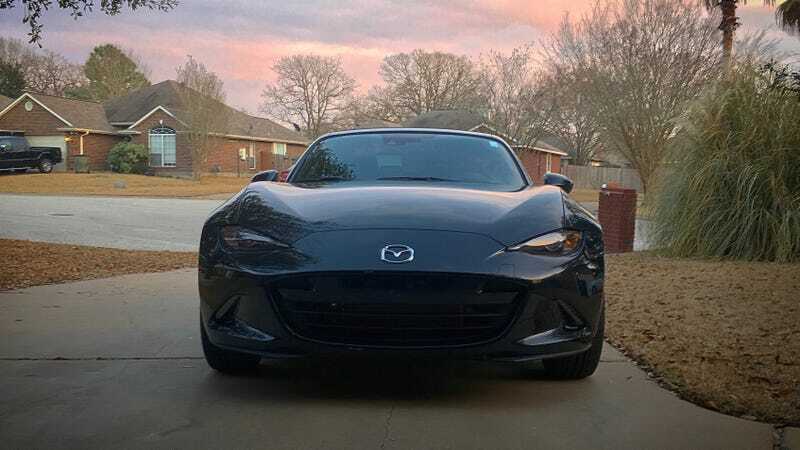 The new Miata pulled into my driveway a few hours later, and I could tell how happy she was. She didn’t care that she spent way more money on this new car than she had planned to spend, because life is short and you can’t take money with you—you can only use it as best as you can while you’re here.